3 Challenge yourself to think outside of the box in how you take the photo or don’t worry about that part and just snap one real quick! 4 Post the photo on your blog or an online gallery. Leave a comment on my blog linked to your photo and be entered into a giveaway. HERE is Elizabeth’s post on her 10:11:12 photos. And here is the photo I snapped at 10:11. Now, the stupid clocks on my computers say 10:12 and 10:14, but my iPhone said 10:11, so that’s what we’re going with, LOL! At 10:11:12 today, I was taking a break from work for a morning snackie. I work from home as a medical transcriptionist. The Macbook you see is my own computer which is usually on a pretty ocean slide show while I work and listen to music (PANDORA.COM) on low all day. But I opened it to show the clock and, what do you know, there is my Twitter page, LOL! 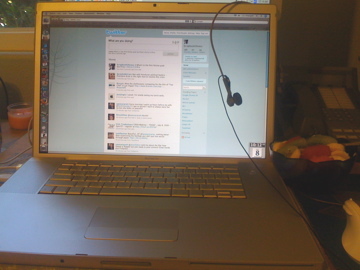 My headphones are hangin’ on my laptop and that’s my fruit to the right….kiwi, banana, and watermelon. My Windows work computer screen sits up behind my laptop but I purposely cut off the screen ~ confidential, dontcha know. Sorry it’s such a dark pic. The room I’m in is west-facing so it’s quite dark until about 2pm when the sun crosses over the house. Well, that was fun. That’s what I was doing on 7.8.09 @ 10:11:12 am…. Of course, in most of the rest of the world, the dates are written day/month/year, so I guess I could do my commemoration on August 7. How’s that for a good idea?! Glad you got to do it! Great pic!